William I, the second son of Henry of Scotland, Earl of Huntingdon and Ada de Warenne was born around 1142\3 and succeeded his brother Malcolm IV as King of Scotland in 1165. William was crowned at Scone Abbey on 24 December. 1165. He was a strongly built man with red hair. William obtained the epithet 'the Lion' through his adoption of a red lion rampant as his standard, which later was to become the royal standard of the Houses of Dunkeld and Stewart, he was known in Gaelic as Uilliam Garbh. William also inherited the title of Earl of Northumbria in 1152 from his father, Henry of Scotland. However in 1157 he had been forced give up this title to King Henry II of England. This was the source of much friction after William became king, since he spent a lot of effort trying to regain Northumbria. William formed an alliance with England's traditional enemy, the King of France. While the then King of England, Henry II's attention was engaged elsewhere, he seized the opportunity to invade. The Scots were however, defeated at Alnwick and their king, was unhorsed whilst charging the English and taken prisoner by Ranulf de Glanville. He taken in chains to Newcastle, from where he was moved to Northampton and then onto Falaise in Normandy. William was subsequently forced to sign the Treaty of Falaise in 1174, placing Scotland under feudal subjection to England. The church of Scotland was also subjected to that of England. William was then permitted to return to Scotland. In 1175 he swore fealty to Henry II at York. King William took an English wife in 1186, Ermengarde, grand daughter of Henry I of England and daughter of Richard, Viscount of Beaumont-le-Maine, the couple, who were married at Woodstock Palace, Oxfordshire, produced four children, the future Alexander II and three daughters, all of which were married into the English aristocracy, Margaret, the eldest of these, born in 1193, married Hubert de Burgh, 1st Earl of Kent, the second daughter, who was born in 1195, was married to Roger Bigod, the 4th Earl of Norfolk. The youngest daughter, Marjorie, born in 1200, was married to Gilbert Marshall, 4th Earl of Pembroke, the son of William Marshal, Regent of Henry III. Scotland's humiliation of the Treaty of Falaise was the cause of a revolt in Galloway which continued until 1186. In 1179 William, accompanied by his younger brother David, Earl of Huntingdon, led a force to Easter Ross, where he constructed two castles, with the aim of discouraging the Norse Earls of Orkney from expanding beyond Caithness. A further rising in 1181 was led by Donald Meic Uilleim, a direct descendant of King Duncan II of Scots briefly took over Ross. William was at last able to free Scotland from the humiliating situation she had been placed in 1189, when King Richard 'the Lionheart', eager to acquire money for his intended crusade to the Holy Land, agreed to return the castles and renounce his overlordship for 15,000 marks. Although William had quarreled with the pope over a church appointment, Pope Celestine III ruled in 1192 that the Scottish church owed obedience only to Rome, not to England. William developed a small but efficient central administrative bureaucracy. He granted charters to many of the major burghs of Scotland and in 1178 founded Arbroath Abbey, which was to become one of the wealthiest monasteries in Scotland the site of the Declaration of Arbroath. Despite the fact that Scotland had regained her independence, relations with England remained fractious during the first decade of the thirteenth century. In August 1209, Richard's brother and successor King John marched a large force to Norham, near Berwick, with the aim of exploiting the flagging leadership of the aging Scottish king. 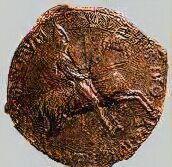 William was forced to promise John a large sum of money, the ailing Scottish king also agreed to the marriage of his elder daughters marrying English nobles and, when the treaty was renewed in 1212, William's heir, Alexander was betrothed to John's eldest daughter, Joan. 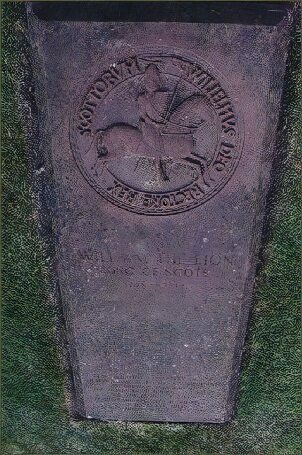 William died, old and senile on 12th December, 1214 at Stirling Castle. He was buried at his foundation of Arbroath Abbey and was succeeded by his son, Alexander II.